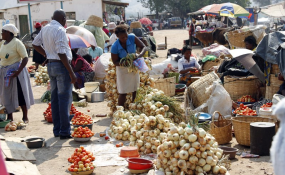 Vendors in Zimbabwe (file photo). Government has availed $6,7 million for urgent health related needs and City of Harare's infrastructural requirements as it intensifies efforts to curb the cholera outbreak in Harare and other affected areas. Treasury has set aside a further $500 000 for kick-starting clean-up campaigns which will initially be targeting selected Harare suburbs and the 23 cholera hotspots. The clean-up programme for Harare Metropolitan Province, which will be spearheaded by The Environmental Management Agency (EMA), will start on December 21, 2018. In a statement Local Government, Public Works and National Housing Minister July Moyo said following the declaration of the State of Emergency by President Mnangagwa on September 12, 2018 various courses of action were being vigorously pursued, notwithstanding that cumulative statistics indicate an upsurge in the cases of cholera as recorded to date. On Sunday, 30 people had died of cholera. "As a way of improving the general sanitation in the city: It has become imperative that all types of vending be banned with immediate effect. Joint Operation System has since been activated to assist in the removal of the vending public," he said. "At this juncture we would like to commend the vending public for paying heed to Government measures. May I also take this opportunity to urge a few wayward vendors who are playing hide and seek with the law enforcement agents to comply." "I am aware that there are some vendors who were operating with permits from the City of Harare. I direct that the law enforcement agents should amicably dismantle the stalls they are operating from." He said Harare and Chitungwiza and the two town Local Boards of Ruwa and Epworth have been directed to develop and immediately implement the programmes of action as a way of addressing the drivers of the cholera/typhoid outbreak in their areas of jurisdiction. Minister Moyo said all this was necessitated by treasury's immediate response to the urgent requirements of the City of Harare in particular and other cities in general. He said so far major burst sewer pipes in Glenview, Budiriro and other suburbs have been repaired and some contaminated water sources (shallow wells and boreholes) were condemned. Councils have intensified collection of solid waste in formal and informal settlements. "Harare Metropolitan Province, in terms of response remains the area of our focus as other cholera cases detected in Manicaland, Mashonaland East, Mashonaland Central, Midlands and Masvingo Provinces are closely linked to the epicentre (Glen View and Budiriro)," he said. "Furthermore attention will also be targeted at the 23 cholera hotspots of Chegutu, Hurungwe, Sanyati, Kariba, Makonde, Chiredzi, Mwenezi, Chipinge, Mutare, Masvingo, Gweru, Rusape, Makoni, Bindura, Shamva, Kwekwe, Gokwe North and South, Beitbridge, Mudzi, Hwange, Chitungwiza and Harare." He said all sub-national structures as guided by Ministers of State for Provincial Affairs were directed to continuously monitor and support efforts by local authorities in addressing some of the drivers of the outbreak. Minister Moyo thanked all organisations that have responded to Government's call for assistance.